On January 4th of 2018, NOAA reported the following tweet showing what is named as a Cyclone Bomb or Winter Cyclone. That week ended with almost the entire East Coast being covered in a sheet of snow. A large, rapidly intensifying winter storm that began on Wednesday dumped over a foot of snow in New England, but also brought with it damaging winds, and dangerous, icy, coastal flooding. 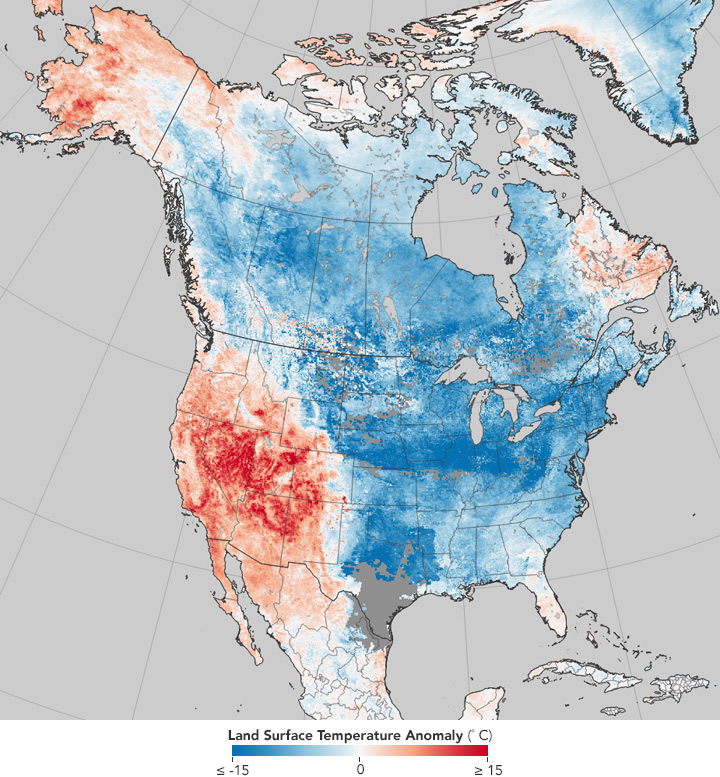 Also, NASA’s Earth Observatory has provided stunning images of the “temperature anomaly” in the U.S., as much of the country faces the perils of a winter storm dubbed the “bomb cyclone.” This temperature anomaly map is based on data from the Moderate Resolution Imaging Spectroradiometer(MODIS) on NASA’s Terra satellite. It shows land surface temperatures (LSTs) from December 26, 2017 to January 2, 2018, compared to the 2001–2010 average for the same eight-day period. 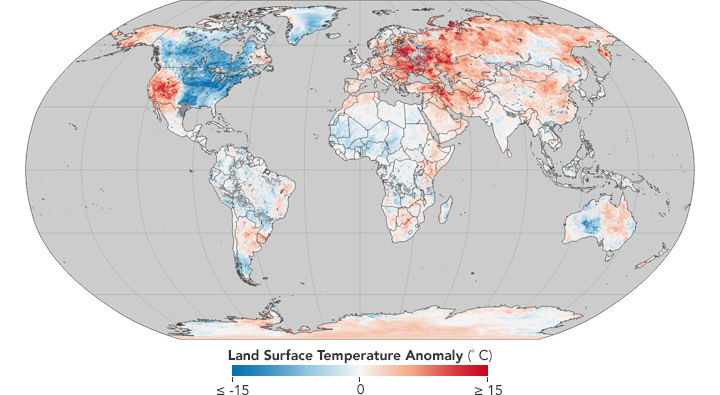 Red colors depict areas that were hotter than average; blues were colder than average. Furthermore, If we take a look at the NASA map of worldwide anomalies, it is clear that the earth is experiencing uncommon temperatures. Even as the Eastern U.S. freezes, comparatively balmy conditions are dominating many other parts of the world. Europe, much of Asia, and the Middle East have been abnormally warm. In the southern hemisphere, Antarctica, eastern Australia, southern Africa, and the Horn of Africa have been warmer than usual, while the Amazon in South America, the Sahara in Africa, and western Australia were cool. These facts are just one part of the total extreme weather events and natural catastrophes which have occurred and is a warning for future events. During 2012, there were 905 natural catastrophes worldwide, 93 percent of which were weather-related disasters, costing US$170 billion. Unpredictable global climate conditions are thought to be on the increase, with recent major events including typhoon Haiyan in the Philippines, flooding in the UK and the big freeze in North America. The direct cost of this weather volatility is also rising significantly with insurers paying out US$701 billion globally for damages from extreme weather events every year for the last three years alone. Such extreme weather events are headline news, particularly in relation to the impact on infrastructure, travel delays, etc. But what about the damage caused to renewable energy infrastructures? Adverse weather conditions can have a dramatic impact on renewable energy installations. High winds, especially when combined with heavy rain, snow and hail storms, along with localized flooding have the potential to cause major disruptions to energy production and distribution. The combination of initial design of equipment, site location and businesses being adequately prepared can influence the level of exposure energy facilities face. External installations, such as wind and photovoltaic, are predominantly situated in more remote locations which increase their exposure to the elements making them more vulnerable against extreme weather events. There are some example of good preventative practices like inspecting buildings (roofs & gutters), inspecting foundations and bolts annually and removing precarious trees and branches over transmission lines, but this is not enough. Weather forecasting helps to warn against these extreme events before they happen and enable actions to be taken to prevent and reduce possible damages to infrastructure and facilities. Sentinel uses weather forecasting data from trusted resources like NREL, NOAA and ERCF and provides an interface in which personalized alerts can be configured so that notifications are received when an extreme event could endanger your facilities. It is better to be prepared for what is coming than not.